A business blogger who changed the wider world view of Microsoft is leaving the software giant for a Silicon Valley start-up. Robert Scoble's blog about his life and events inside and outside Microsoft became the unofficial corporate voice of the company. Many turned to his blog to find out how the firm reacted to big news events. His blog won praise for its neutrality and readiness to point out Microsoft's mistakes or praise its rivals. 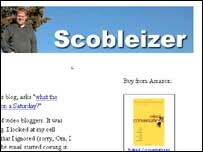 Mr Scoble's blog, called Scobleizer, is widely seen as helping to humanise Microsoft and shift its stance from arrogant and aloof to one that is more inclusive and accepting of criticism. It also commented on broader changes in the net world and how they affected the company. The blog was seen as a pioneer in the way that companies present themselves to the world by giving a human voice to what can be faceless corporations. The success of Scobleizer kicked off a number of copycat blogs which aimed to expose the inner workings and opinions of other companies to more public scrutiny. Within Microsoft, Mr Scoble helped to run the Channel 9 news site that aired video interviews with hundreds of employees to gain an insight into the projects they were working on. Mr Scoble will stay at Microsoft until the end of June and then move to start-up PodTech.Net. He joins as vice-president of content and will help prepare video interviews with the great and good of the technology world. In a fitting twist, the news about Mr Scoble's departure broke on another blog before he had chance to tell regular readers via his own journal. In a posting on 10 June, Mr Scoble explained the reasons for his departure and said it has not arisen because he had fallen out with his employer. "I love Microsoft and Microsoft did not lose me, at least as a supporter and friend," he wrote in the entry.